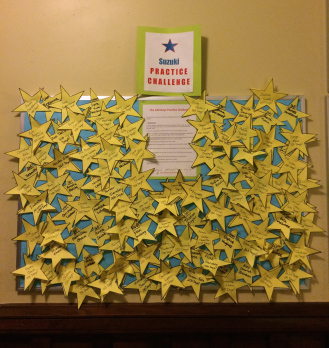 Stars are put up on the bulletin board on the fourth floor every one to two weeks to announce accomplishments of consecutive days of practicing. We make stars for 30, 60, 100, 200 & 300 days, as well as one year (365 days) and two years (730 days), and finally 1000 days. Use this online form. Names and numbers are announced at recitals, and instrument-specific festivals. Deadline: 2 weeks before event. Certificates are awarded for increments of 100 days/years. 2 weeks before event. Trophies are given for one- or two- year accomplishments. 4 weeks before event. Students who have reached 1000 days are added to the plaque on the fourth floor hallway. 4 weeks before event. Parents should use this online form or email suzuki@bkcm.org when your child reaches a practice landmark. We also recommend parents to submit your child’s numbers in advance of accomplishment dates, in order to meet above deadlines. 1. The challenge is recommended for all students, especially in the first year or two of classes, but is not required. 2. The challenge is especially helpful if the child has already seen the Star Board, or has seen someone else receive a certificate or trophy, and is therefore self-motivated to participate in the challenge. That said, once a music student has practiced consecutively for 30 days, the joy of learning will become the main motivation. 3. Parents identify a start date of the 100 Days Challenge with child. Ask registration for a chart template you can use, or you can make your own. You can also find cute printouts online. For example: 100-times- charts Or search online for other great charts. 4. Make sure to discuss with your PRIVATE TEACHER what is required for a day of practicing. This will vary depending on the child’s age, level, and attention span. LISTENING AND at least three REVIEW pieces or skills are required for a day of practicing to count! 5. Children must practice CONSECUTIVE DAYS. Double practicing does not qualify for missed days. 6. There must be instrumental playing. 7. If child is sick enough to stay home from school, then just listening to the CD “counts”. 8. Students with lessons/group/theory on same day are not required to practice on that day. 9. Students should practice on lesson day and group/theory day if they are on separate days. 10. Any exceptions should be approved by your teacher AND department head. ♦ For example, exceptions can be made during travel vacations for piano & bass students for whom it is impossible to bring along an instrument. Alternate requirements might include Puppy Packet games, listen to CD, a musical activity, sing, etc.